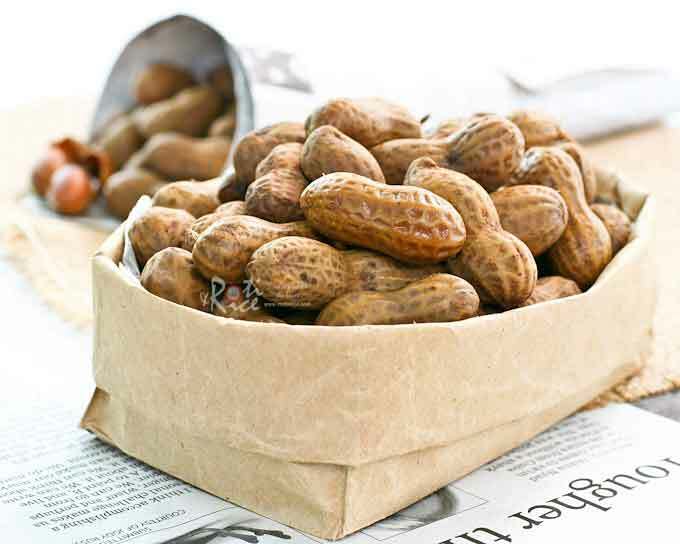 Boiled Peanuts – a deliciously simple and tasty snack. Takes several hours on the stove (much faster in a pressure cooker) but well worth the effort. One of my most enduring memories of going to the cinema in the old days was the quick detour after the ticket counter to the peanut man standing at one corner of the entrance. This was long before the advent of the modern concession stand with its soda machine and prepackaged snack food. Peanut man is perpetual surrounded by a wreath of steam emanating from the large pot topped with a conical metal lid attached to his tricycle. When approached, he transfers a pile of steaming hot nuts into a newspaper cone for my waiting hands. Then the fun begins. Going into the dimly lit cinema with the air-conditioning blasting at the seats, I get to warm my hands with the steaming cone. Before the movie even begins I have already finished almost the entire packet of nuts. 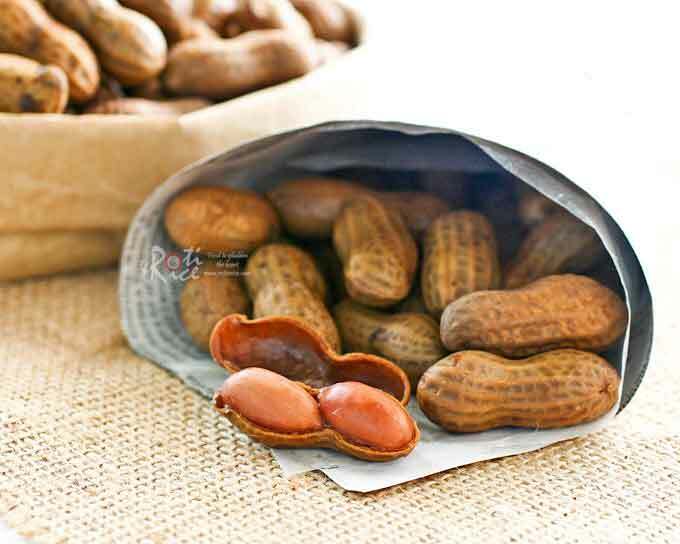 Boiled peanuts are soft enough to be quietly squeezed open with your fingers or teeth. There are no irritating cracking and crunching sounds to interrupt the viewing pleasure of other movie goers. For the boys, the shells serve as ammunition to act out their own war movie among the seats. Ahh…the simple pleasures of life! Yes, it is time for another installment of Nona-Nona with my buddy Denise. The theme for this month is street snacks and boiled peanuts are just the thing as the weather gets colder here. Raw peanuts are also currently available at the Asian grocery stores. In doing my research, I discovered that boiled peanuts are also a favorite in the Southern States. That should not be surprising since “goober peas” as they are known there, come from a large supply of peanuts grown in states like Georgia. There is even a popular Civil War era song of the same title. Boiled peanuts are very easy to prepare. 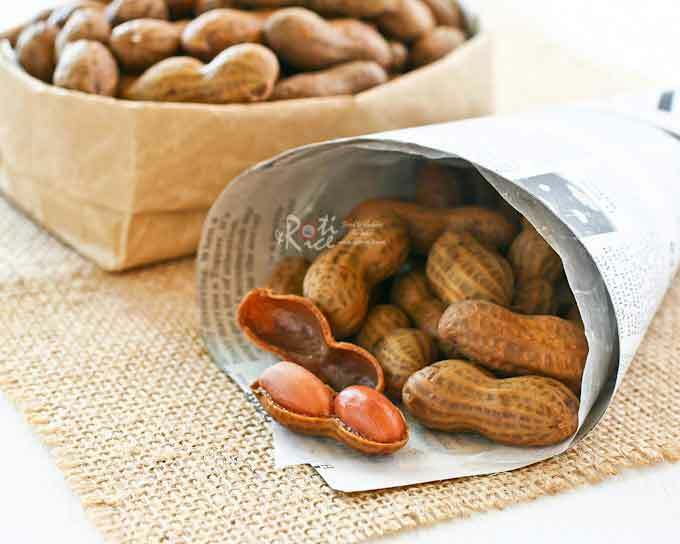 Raw peanuts from the store need to washed and drained to get rid of any soil and dirt. They are then placed in a large pot of water with some salt and boiled until soft or the cows come home, whichever is sooner. Using a pressure cooker is probably a good idea and I will do that the next time. I have purposely kept it very simple this time using only salt to flavor the peanuts. Sugar, star anise, and other spices may be added. The cooking time may also vary. If you like the peanuts really soft, just continue boiling until the desired texture is achieved. It can take anywhere between 4 to 8 hours. Boiled Peanuts - a deliciously simple and tasty snack. Takes several hours on the stove (much faster in a pressure cooker) but well worth the effort. Wash peanuts 4 to 5 times to get rid of dirt. Place in a 5-quart pot. 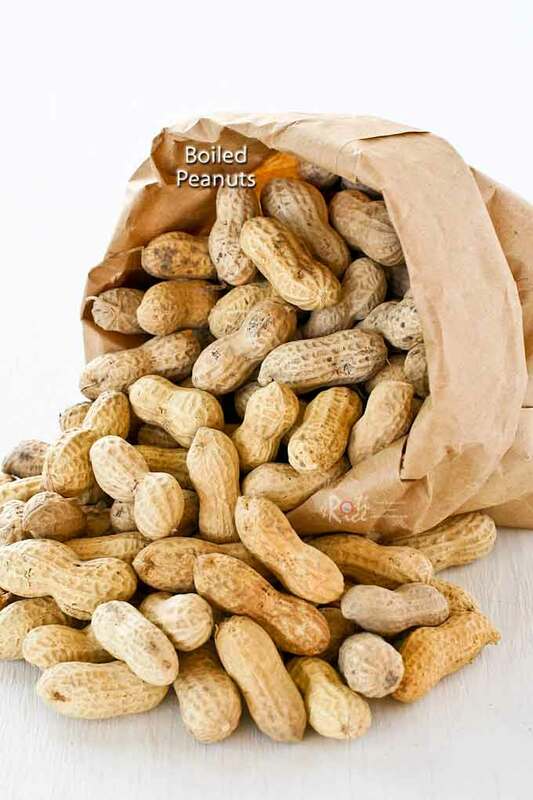 Fill with enough water to cover peanuts. Place on the stove and allow water to come to a boil. Add salt. Lower heat and allow peanuts to cook for at least 4 hours**. Add a ½ cup water after every hour. Remove and drain. Serve warm or at room temperature. Peanuts may be kept at room temperature for up to 2 days. 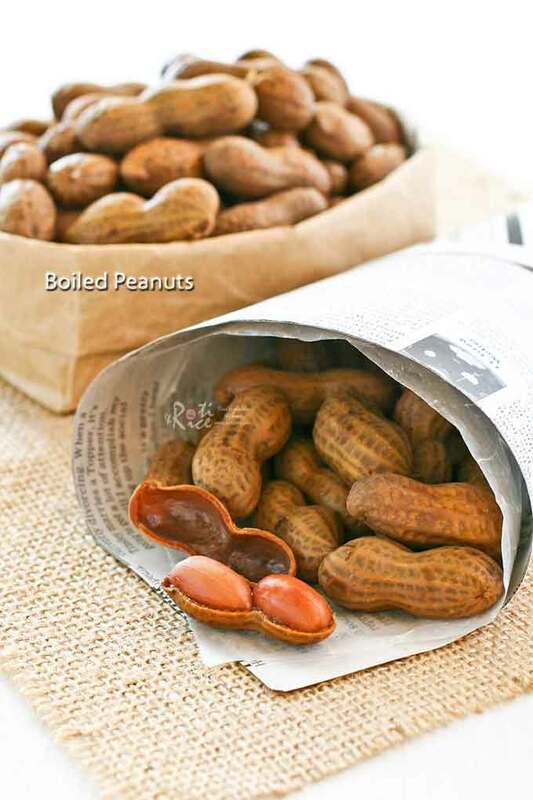 ** For softer peanuts, continue boiling for up to 8 hours. It takes about 1¼ to 1½ hours to cook in the pressure cooker. Soaking peanuts overnight reduces the cooking time. I thought the peanuts here took a longer time because they are plumper. I actually prefer them a little softer but after 4 hours, I needed to get out of the house to do other things. Will use the pressure cooker next time. I don’t know it actually takes so long to boil peanuts. Wow, almost 4 hrs! Nice write-up and an interesting twist on the kind of peanuts I’m used to. I like that the softer shell would also reduce the amount of ‘splinters’ I get in my mouth after cracking them open. Will try! I remember this snack…actually I used to buy lots of those boiled peanuts. So much healthier than the roasted one, but delicious all the same. I love your expression about boiling “till the cows come home” because that’s exactly what my mum said recently when I queried her about the can of boiled peanuts she had in her store cupboard. Mum is one of those who prepares stuff from scratch and to find that can of boiled peanuts is a contradiction of her nature. She said she couldn’t be bothered to wait for a few hours to cook the peanuts and it is instant gratification to open a can and have a few when she fancies them. 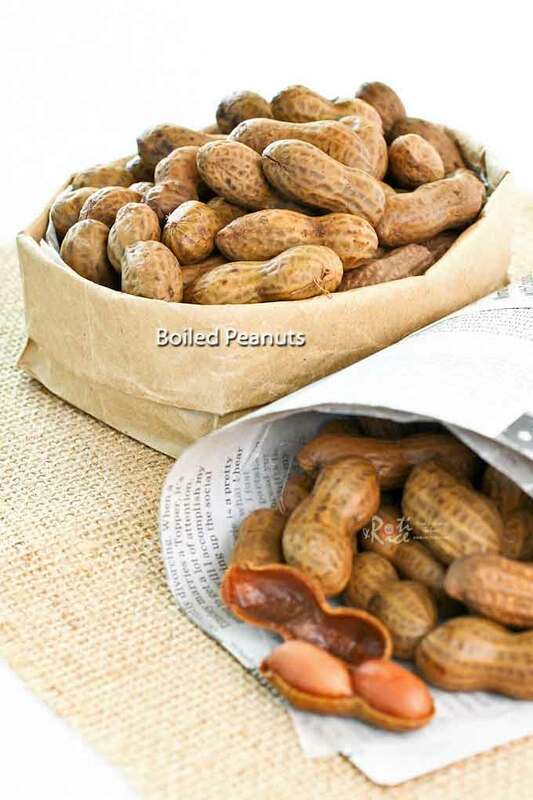 I loved these boiled peanuts and I am going to look out for them at our store – just have to find a day when I have a good few hours at home to must them!!! Brilliant post, as always, Biren. This looks great! I love the photos. Boiled peanuts are great and still popular here in the south. We have a gas station called Peanut Joe’s and he still sells boiled peanuts as he has for years…so it’s easy to come by for me. I like the idea of adding different flavors though! I love to snack on this. I’ve never boiled peanuts before, and it’s something I really want to do sometime. This is a huge dish in the south in the US – in some places there are roadside stands hawking boiled peanuts. 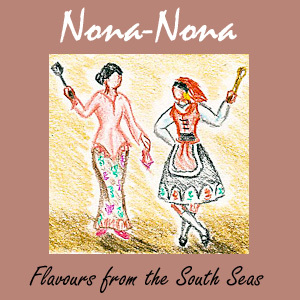 Nice post, great recipe – thanks. I’ve had one experience with boiled peanuts and I have to admit that it wasn’t a positive one. I don’t think they had been cooked longer enough because they weren’t soft as you describe. Instead they were quite firm and tasted like uncooked pinto beans. I can imagine that a soft cooked, salt peanut would be much better. I love the simplicity of this snack, but I had no idea it takes that long to boil! Love the way you presented the kacang rebus -the way it should be…wrapped in newspaper cone 🙂 Fantastic! I love the way u did this. We. Used to get these at football games in Hawaii. I didn’t know their origin because you know Hawaii has so many nationalities. I have made these once before. Will make these for our next Hawaii Club get together in Texas.